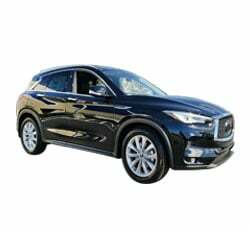 2019 Infiniti QX50 Trim Levels with Comparisons & Configurations. What 2019 Infiniti QX50 Trim Level Should you Buy? What is the Difference Between Trims? If you're in the market for a new two-row luxury crossover, make it a point to go check out the redesigned 2019 Infiniti QX50. Many car reviewers consider the new QX50 to be a great alternative to a more expensive European model. You'll appreciate its roomy and comfortable interior design. Impressive fuel economy makes the new QX50 an even more rewarding family vehicle. Of course, a lot of drivers are drawn to this SUV's sharp exterior styling. Here's what each trim brings to the table. Compare the 2019 Infiniti QX50 Pure vs Luxe Trim Levels. What is the difference? With a starting price of $36,550, the base Pure trim is your most affordable option. However, it still proves to be a very rewarding choice. Power comes from Infiniti's advanced VC-Turbo four-cylinder engine. It's designed to deliver the punch of a traditional V6 engine while saving more fuel. Total production stands at 268 horsepower and 280 lb-ft of torque. An automatic CVT transfers the available power to the front wheels. However, an intelligent AWD system can be added as an option. When looking at the new QX50 Pure, you'll notice its attractive exterior styling. A nice-looking set of 19-inch aluminum wheels with run-flat tires come standard. Signature LED headlamps also help the QX50 to stand out. Dual exhaust outlets further highlight the SUV's sporty design. Infiniti offers the QX50 Pure in six different exterior colors: Black Obsidian, Chestnut Bronze, Graphite Shadow, Hermosa Blue, Liquid Platinum, and Lunar White. When you step inside the QX50 Pure, expect it to have a luxurious character. The interior's simulated leather upholstery has a high-quality feel. While front passengers will enjoy the comfortable power-adjustable seats, rear occupants can take advantage of the QX50 Pure's reclining and sliding seats. When loading cargo, the hands-free tailgate will make things easier. Dual-zone automatic climate control comes standard as well. Despite being the base model, the QX50 Pure packs ample technology. Infinity's dual-screen infotainment system enables you to perform multiple functions. You can stay entertained by listening to the six-speaker sound system with satellite radio. Meanwhile, a total of four USB ports enables your family to keep their electronic devices juiced up. Other standard features include keyless ignition, a backup camera, and hands-free Bluetooth. Fortunately, some important safety technologies are found on the QX50 Pure. Designed to detect a potential crash two cars ahead, Predictive Forward Collision Warning keeps you aware of fast-approaching road hazards. Along with the system comes automatic emergency braking, which includes pedestrian detection. A tire pressure monitor comes standard as well. A starting MSRP of $39,400 makes the QX50 Luxe nearly $3,000 more expensive than the QX50 Pure. Nevertheless, it does provide a few nice upgrades. Although the QX50 Luxe looks similar to the QX50 Pure on the outside, roof rails and LED fog lights help set it apart. The same 19-inch wheels come standard. Don't expect to see any big differences on the inside. However, a panoramic sunroof enables you to look up at the sky. You'll also appreciate the auto-dimming rearview mirror, which helps deter headlight glare. Heated front seats are available as an option. Infiniti also offers a special Dynamic Sunstone Red paint finish on the QX50 Luxe. Like the base model, the QX50 Luxe comes equipped with forward collision intervention. However, you'll also benefit from advanced blind-spot monitoring. Keep in mind that rear cross-traffic alert is not included. Compare the 2019 QX50 Luxe vs Essential Trims. What is the difference? Atop the lineup sits the lavish QX50 Essential. Like the rest of the lineup, it comes standard with a VC-Turbo engine. You'll also be hard-pressed to spot any big styling differences between the QX50 Essential and the QX50 Luxe. However, heated outside mirrors and automatic wipers give the QX50 Essential a more luxurious nature. What sets apart the QX50 is its more elegant interior. It's the only trim that provides leather upholstery. Three-zone automatic climate control seeks to keep you and your passengers more comfortable. When attempting to park, you can take full advantage of the 360-degree camera system. Moving objection detection gives you even more security in congested areas. Other upgrades found on the QX50 Essential include parking sensors, remote engine start, and navigation. For the folks who aren't satisfied with the Essential trim's standard equipment, Infiniti offers some optional packages. During the winter time, you'll be thankful for the Premium Heat package. It brings heated front seats and a heated steering wheel. Driver-seat memory settings also come in this package. The available Sensory package adds more goodies. While climate-controlled front seats make summertime driving more relaxing, rear window shades help keep your kids comfortable. Meanwhile, an air purifier helps allergy sufferers to breathe a bit easier. Premium leather upholstery and a simulated suede headliner further enhance the QX50 Essential's beautiful interior. Night driving on rural roads is made more secure by the adaptive headlights. You can also get the QX50 Essential with a more powerful audio system. It excites music fans with a total of 16 speakers. You'll immediately notice the more impactful sound. If you plan to pull a trailer or camper, strongly consider the QX50's optional towing package. It enables you to confidently pull a 3,000-pound load. You can further enhance your on-road security with the QX50 Essential's optional Pro Assist package. It provides backup collision mitigation, which automatically activates your brakes when encountering unseen vehicles. On the other hand, traffic-adapting cruise control seamlessly regulates your speed. Rear cross-traffic alert and distance control alert are also included in the Pro Assist Package. Infiniti goes a step further by offering a ProActive package. It comes with adaptive steering, which decreases driver fatigue. When attempting to change lanes, Blind Spot Intervention can steer you away from danger. A parking system helps make your commute less taxing. By activating the more advanced cruise control system, you can experience semi-autonomous driving. You'll also enjoy a color head-up display, which puts the most critical driving information onto your lower windshield. With only three available trims, the 2019 Infiniti QX50 makes it a bit easier for buyers to make a decision. Drivers who don't desire any premium upgrades will be completely satisfied with the base QX50 Pure. Sharp exterior styling and a versatile engine make it a rewarding pick. Most people will find the base QX50 Pure to be just as accommodating as the other trims. The reclining and sliding rear seats are a nice touch. Your family will be able to kick back on long road trips. Once you learn how to use the Infiniti InTouch infotainment system, its functions will gradually become second nature. You'll especially appreciate the QX50's world-class forward collision system. The mid-level QX50 Luxe is not a better buy than the QX50. It doesn't benefit from any appearance upgrades or any extra creature comforts. Blind-spot monitoring is its biggest upgrade. You may also desire the panoramic sunroof. When traveling on the highway, this valuable safety innovation will make life easier. If you don't care about these features, save your money and stick with the less expensive QX50 Pure. When compared to the other trims, the range-topping QX50 Essential is clearly a step above. Although this trim has a steeper price tag, its starting MSRP of $43,350 still proves to be a solid deal. While urban dwellers will enjoy the 360-degree parking camera, travels will benefit from the navigation system. If you don't mind spending more money, you can further deck out the QX50 Essential. While the available climate-controlled front seats and Bose premium sound system are nice, you can only get them in the optional Sensory package. This package is a whopping $7,500. The cost increase makes the new QX50 less of a value. Although the QX50 Essential's optional safety technologies are extra money, you won't regret your decision to buy them. Only a few crossovers in the segment offer innovations like Blind Spot Intervention and backup collision mitigation. All versions of the 2019 Infiniti QX50 come equipped with Infiniti's TwinTouch infotainment system, which features dual screens. You'll find the lower display to be especially quick and responsive. While navigation is available, you won't be able to get Apple CarPlay and Android Auto smartphone support. Infiniti's all-new VC-Turbo engine is among the most sophisticated on the market. It adapts to the specific demands of the driver. Fuel economy estimates stand at 24 mpg in town and 31 mpg on the highway. This means the new QX50 is far more economical than the last year's model. Furthermore, very few rivals prove to be as efficient. Like the previous-generation QX50, the new model can be equipped with all-wheel drive. However, ground clearance has increased by a full 2.0-inches. This is a big advantage for the drivers who must deal with snowfall. A laundry list of advanced safety technologies are available for the new Infiniti QX50. Luckily, all of them are remarkably easy to use and effective. You don't have to pay extra for the Predictive Forward Collision system, which gives you more time to react to unexpected danger. An Autograph package is available for the drivers who desire unique styling. It equips the new QX50 with an exclusive set of alloy wheels. Special interior treatments give the QX50 an even more breathtaking look on the inside. The quilted leather upholstery is designed to look like tropical white sand. Dark blue suede also highlights this luxurious appearance package.